This is for one car show entry. This entry includes the drivers admission. All other vehicle occupants will need to purchase a single day admission ticket. Kids 12 and under are free. Includes drivers admission to event. All other vehicle occupants will need to purchase a single day admission ticket. This allows you to register one vehicle to race. Classes on Saturday are extra. See www.streetcar-takeover.com for details. Driver admission is included with tech card purchase. All other crew and passengers with racer at the gate will need a single day or two day admission ticket. This allows you to register one vehicle to race both days. Classes on Saturday are extra. See www.streetcar-takeover.com for details. Driver admission is included with tech card purchase. All other crew and passengers with racer at the gate will need a single day or two day admission ticket. 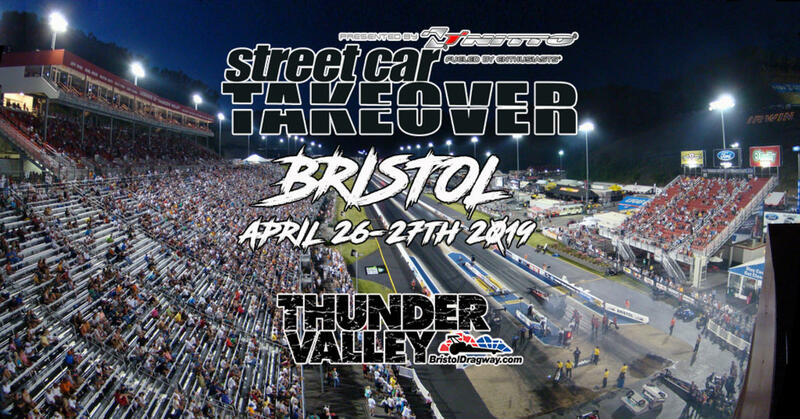 Street Car Takeover Bristol coming April 26-27th 2019 at Thunder Valley. Event will feature test n tune, drag racing, roll racing and car show with huge cash payouts and awards! Street Car Takeover is coming to Thunder Valley Saturday April 27th 2019! Racing and car show starts at noon.